It was in 2009 when the world economy took a downturn that we had the idea that the safest way of investing money was in a property so we decided to buy a small house somewhere in Europe. 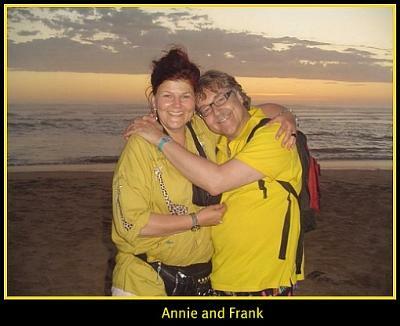 We, Frank and Annie from Hamburg,Germany, took loads of spare time surfing the web and had been virtually to many nice places like Spain, Italy, Greece and England. Yet we could not find the right place. We could not ignore the fact that the internet was full of websites recommending South Africa as the upcoming country. So we landed on a foreign continent called Africa. It was said (by many people around us) to be overcrowded by big blue beetles and cannibals, living in round straw huts, playing bush drums and presenting shrunken heads on the top of their spears but regardless, we dared to continue to investigate this frightening dangerous place! We had never been to a foreign continent before, had not even wanted to accept a longer flight, therefore we had not spent a thought of buying a home in SA, but we realized that we could not keep our eyes off that wonderful nature described on so many websites. Our curiosity made us check into property around Cape Town and Simons Town. Some links even led us to Little Karoo and Kwazulu Natal where some small estates were to be bought. We could not get South Africa out of our minds and one sunny day in May we discovered the Garden Route, advertised as SA's most beautiful region. We were so amazed by all these charming villages along the coastline that we decided to look for property there. We jumped from site to site till we clicked on the "Kingfisher Properties" link. They had exactly the house we were dreaming of. In an excited buoyant mood we looked for a B&B in Sedgefield managed by Germans who could help us find out whether the house was really nice and in a proper state to be worth buying. Those Germans were Peter and Sabine Eberle operating the Schwabenhaus Eberle at Disa Street in Sedgefield. Very quickly a cordial relationship was established and they were very willing to assist us. After they had given us positive feedback in all aspects, we contacted Mrs. Helga Matusik, one of the three ladies managing Kingfisher Properties. She mailed so many photos and answered so many questions positively that she finally had "to feel responsible" for our decision to buy that jewel. She settled all things that are necessary to buy property via internet in a friendly manner, quickly and professionally. We still cannot believe that everything was so un-german, but nevertheless practicable, so easy to handle, a contract, the signature, only by email, no solicitor. But valid as well. INCREDIBLE!!! Peter and Sabine Eberle agreed to meet us in Cape Town. They offered themselves as guides for 4 days through the Cape region, arriving to meet us with our leased car in order to drive us along the Garden Route to Sedge as we were not used to driving on the left-hand side of the road. That is how we gained our first insights into SA. It was a relief to realize that some of our friends' ideas about South Africa were archaic. We were glad to see hospitals, public toilets (clean and presentable, as good as in any 5 star hotel! ), shopping malls, post-offices and cemeteries. Electrical equipment was also - Wow! The words fridge, TV and even Internet(!!!) but no bamboo huts! We never stepped on any huge blue bugs. We never were attacked by wild animals and the most shocking perception - nobody was interested in our heads not even the beautiful one of my oh so handsome husband! This really disappointed me, no, even insulted me! We do not curry favour when we say that we quickly fell deeply in love with the magnificent natural environment and the warm-hearted people, black and white, no difference - their friendliness, helpfulness and straight forwardness, even from obviously poor people who still had ready smiles for us. A rainbow nation that impresses us so much (and we think not only us!!). We can´t find the right words to say how lucky we are. 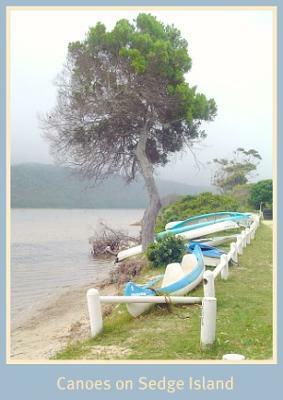 Sedgefield on the Garden Route is really the most beautiful spot in the most beautiful area of South Africa... No, on EARTH! We can easily imagine coming to retire here. Especially since the first African Cittaslow, Sedge allows us to change down one gear maybe two! During our short stay we ate out at some local restaurants. We met a very nice couple from Sedge who made our stay very enjoyable feeding us with their tasty dishes. 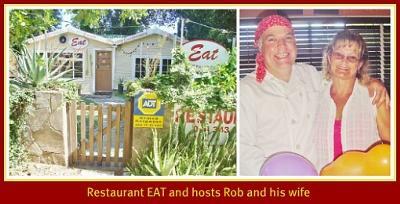 Rob originally from Jo´burg and his wife manage the restaurant "EAT" in Main road, where we loved to sit in their beautiful garden enjoying the delicious ice cream and coffee they offer. 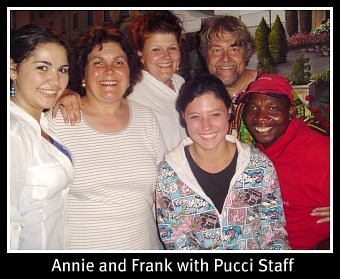 "Pucci´s" restaurant is one of our favourite places in Sedge. We feel at home there and we call the female boss Mama Pucci. She´s so sweet! Here is a picture of us all! Comments for How we found the most beautiful spot on Earth! I have felt this post very interesting and actually I didn’t know how to find the most beautiful spot on earth. You have mentioned the way in a simple and meaningful method. I am so happy in that. Pest equipment"
Join in and write your own page! It's easy to do. How? Simply click here to return to Sedgefield Stories.